Amid a startup wave in Santa Monica, a revitalizing downtown and an emerging tech corridor on Highway 101, a younger and hipper group of entrepreneurs is beginning to reshape the corporate culture of Greater Los Angeles. That’s part of the reason why it put a smile on my face to see two companies from Ventura County emerge victorious from the 2015 edition of Ernst & Young’s Entrepreneur of the Year awards. Keynoting the June 16 dinner was LA Mayor Eric Garcetti, whose message to nearly 1,000 people at the Beverly Hilton was that he wants the City of Angels to challenge the Silicon Valley for supremacy in innovation. “The New York Times says people are leaving Brooklyn for LA,” he boasted. Richard Riordan spoke more than a decade ago has there been the kind of vibe that accompanied this year’s program. For all the bravado about an emerging LA challenging the Bay Area’s tech giants — Apple, Google, Facebook and Twitter — the truth is that LA alone can’t do all of the heavy lifting. It needs the spirit of entrepreneurship — and a century of success building niche companies that’s in the business DNA of Ventura, Santa Barbara and San Luis Obispo counties — to truly match up with the Bay Area. Underscoring that essential truth was Shiva Rajagopalan, founder of Seven Lakes Technology, a 55-person software company in Westlake Village that won in the Business Services category. The former Chevron engineer founded Seven Lakes to bring advanced software solutions to large energy companies which he said are “one to two generations behind” in adapting to the new world of tablets and apps. “I’m truly humbled,” a surprised Rajagopalan told me. A few minutes later, Jeff Green and Dave Pickles of The Trade Desk, a Ventura-based digital advertising platform that’s been recognized in the past by The Business Times, won in the Marketing & Advertising category. This was the third try for Green and Pickles, who built their platform around serving advertising agencies — not around individual companies — resulting in really fast growth. Three finalists went home without hardware but not for lack of a great story. Matt Marquis of Pacifica Hospitality would perhaps have been a stronger contender in the real estate category but the judges didn’t see it that way. Emerging Company contender Melissa Kieling of PackIt has a remarkable personal comeback story and has not finished winning awards. 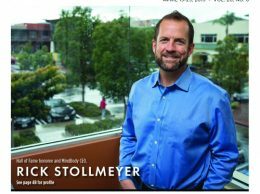 San Luis Obispo-based Movement for Life is an innovator in health care with a unique employee-ownership structure that itself is worthy of recognition. My take away was that after a lost decade for business and entrepreneurship, Los Angeles seems to have recovered just a bit of its entrepreneurial swagger. The slowly turning battleship that is the vast LA economy is part of it. So is Garcetti, a dynamic young mayor who can pitch a group of venture capitalists as easily as pushing through a $15 minimum wage. From tourism to home finance to demand for our agribusiness products and business services, a vibrant LA economy is extremely important to the success of the Tri-Counties. Meanwhile the buzz among the bankers, lawyers and CPAs at the pre-dinner cocktail was about those two hot Central Coast IPOs — Mindbody in SLO and AppFolio in Santa Barbara.